Uncategorized — Comments Off on “Businessman & Investor” – Buffett. I don’t aspire to compare myself to the man. But his view does match my personal experience. As a founder, I’ve sometimes been criticized by VCs that I regard my time in startups too much as an investment. I am proud of this. And I am happy with the fact that I can support founders with my operational experience. Both have worked so well for me. I am an entrepreneur and an investor. Interacting with new founders has been amazingly productive also for my own “flagship” business, now FLIO. The difficulty lies in one word: focus. 2015: Active involvement in 3 companies I have founded. In 2015, I was a happy shareholder in 9flats, which I had founded, in avocadostore, which I had co-founded, and FLIO, experts in digital airport experience, which I founded in 2015. Fortunately, the 2 companies that I did not run myself were in very capable hands. This was a key component in a happy life back then (Thank you Mimi & Roman). At the end of 2016, I had divested of my shares in 9flats when we had acquired Wimdu which we later sold to Wyndham hotels. Early 2017, more much more reluctantly, I sold my shares in the growing eco market-place avocadostore. This enabled me to focus much more on FLIO. FLIO is a very big bet, which can yield phenomenal results for all stakeholders if it pays off: Passengers value guidance through airports, and if we work directly with many airports, we will be able to give them a better passenger experience. In October 2017 we announced that we have agreed to funding from Avi Alliance, an investor in airports. (Update April 2018, FLIO was accepted to Plug and Play Silicon Valley). In early 2017, I started to invest more broadly in early stage deep tech through my vehicle Density Ventures. While I had only invested in 3 startups in the past 10 years, I have invested in 6 companies in 2017 alone. Why I started to do this and how it evolves, I hope to detail here in my next post. For now, focusing on one major bet, while adding several small bets seems to work better for me than spreading myself across three major shareholdings. Uncategorized — Comments Off on It’s a marathon, not a sprint. One of my favorite bits of experience sharing with entrepreneurs is: “It’s a marathon, not a sprint”.And when I coach other founders, I keep telling them that it takes a long time to build a great business. Gareth Williams, the CEO of Skyscanner just reminded me of this in his interview, when he said that Skyscanner’s first month’s revenue was GBP 46 after 2 years. The fact that you have to focus for a very long time to become successful, is much harder to accept for my own companies. Flio has now been live for more than two years, and we’ve been working on Flio for three years. I’m glad to say that our monthly revenues are very healthy, but nevertheless, it feels like there is still so much work to do until Flio becomes as relevant as I think it deserves. 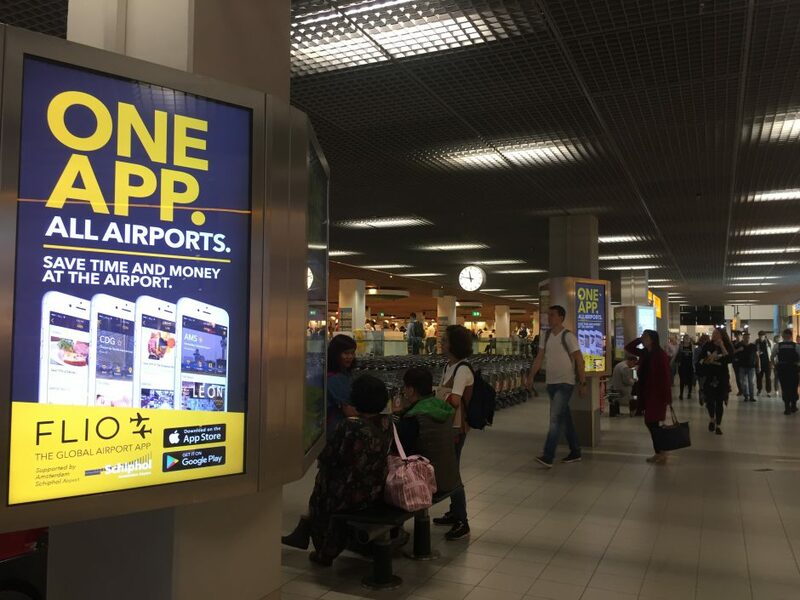 So when Flio becomes visible like here in Amsterdam Schiphol airport, we’re obiously very proud as a team. As a passenger, you can find official Schiphol content on Flio and tons of great deals. Uncategorized — Comments Off on Systems versus Goals – Scott Adams, Warren Buffet and some Zen. As entrepreneurs, most of us are goal achieving machines. At least those entrepreneurs who are successful. A lot of my close entrepreneurial friends are fantastic in achieving their goals. In our organizations, it is much easier for people to work together if there is a common goal. I am by all accounts good at achieving goals. Get a great university degree, become an entrepreneur; study abroad, buy first apartment, build a company, get funded, sell company, raise a family, to do only things that have a meaning – whatever I set out to do I’ve achieved- with the exception of achieving some ideal weight. If goals are so great, then what is wrong with goals? Most overachievers pay a high price for their achievements – they are never happy for a long term. Over time I did improve. In the past couple of years I changed. I started to define a great day as a day when I spend time with my wife, my kids and do some great exercise. A good day is also defined by having meaningful intellectual exchange with people I respect. So a good day really doesn’t have anything to do with achieving more, or having more. In personal life, going back to dieting: losing 20 pounds is a goal that is usually always doomed, while focusing to change your habits for a different diet is a system that will last. As a serial entrepreneur, I have evolved my system of identifying a market niche which fullfils a genuine user need, using an intact reputation to get the best possible people on board, acquire capital without over promising and executing fast. But I don’t have a goal of “x million in y years”. And I am certainly more happy for it. In investing, I trained for years to identify companies that have evolved a great system. A company an idiot can run, to paraphrase Warren Buffet. Buffet has built one of the best systems himself with building a company that automatically increases earnings over time. Regus plc has built a system to constantly increase their office space without taking on the risk involved. In Germany, Rocket Internet is a system that can churn out companies at a bigger scale than anyone else. Speaking of Buffet: As I attended Berkshire’s annual shareholder meeting for the 5th time this year, I realised something in the way Warren Buffet spoke about a recent acquisition in Germany and potential future acquisitions. I had foolishly assumed that there was some kind of big plan for what he does. But: There is no big plan: They made decisions to acquire companies within less than a day. Buffet just happens to have a system of capital allocation and a certain pattern for companies that fit into BRK. And he communicates which companies might fit, wanting to become the preferred buyer for certain sellers. – A system without goals. “If you do something every day, it’s a system. “Before enlightenment: Chop wood, carry water. Uncategorized — Comments Off on Introducing Density Ventures and a new Startup. Too many people have asked me over the past couple of weeks: “What are you working on right now”. Time for some communication – and a rebrand. Over the past year I have worked with several startups that I advised or invested in. I’ve learned that I am most efficient when I can leverage my own preferences and my own experience into the future. So far, I’ve done “local” quite successfully with Qype. I’ve done marketplaces with 9flats (large) and Avocadostore (small). Before that I did a lot of media, ranging from the small GEO.de to the extremely large Bild.de. I’ve advised or worked for companies in Fintech, in eCommerce, in Pharmaceuticals (DocMorris). I’ve had a lot of exposure to the travel scene with travelchannel, lastminute.com and again 9flats. And I’ve always shied away from gaming, gambling and payday loans. I only want to do meaningful stuff. This has worked really well for me during the past 10 years. Enter Density Ventures. I think there is a common ground between local, marketplaces, smart cities. I enjoy discussing strategy with my friends at yell.ru (a Russian Qype, funded by Kinnevik), or expansion with wundercar as well as micro location with BeaconInside. It all seems to work well together. Here is a link to the Density Ventures website and my current portfolio. A new startup: FLIO. As part of Density Ventures, I am currently working with several people on a new “focus venture”, which I hope will be much bigger than Qype. I can’t say too much about it at the moment, but it will be an app that every one can use at airports, register here to see when it will be launched: Getflio.com. Last week, my friend David Rowan called me a “one person accelerator”. But in reality, I just enjoy doing two things at the same time, being an investor – selecting and supporting future startup successes and also being a businessman or an entrepreneur. Hopefully I can continue to alternate between these roles. I certainly can confirm what Warren Buffet is claiming: Doing both makes you better at both. P.S. What gives, what won’t be part of Density Ventures? Media. I still love media, but I’d rather do this in a different context. I would love to see a news app that actually makes money. Or an advertising model that pays for great journalism. Media won’t be a part of Density Ventures. And eCommerce. I love eCommerce, but at the moment it seems like a game of losing money today for market share in the future, which I don’t know how to win. all / all / all / all / all — Comments Off on Let’s all switch off voicemail. Being over 40, I have switched off voicemail about 5 years ago. I just hated to listen to it and having to call people. I call back missed calls from known numbers anyway. It just felt natural to me then and over time, fewer and fewer people complained. I think I saved a lot of time and nobody has every been worse off for it.